Give your children their first taste of classical music. Join us as Music & Truffles KIDS celebrates its 17th birthday with an inspiring season of fresh, interactive music events sure to delight the young and the young at heart. Our unique one hour format for the 2019-20 season features two string quartets from Czechia and United States, two smashing violin and piano duos, and a lovely mezzo-soprano voice accompanied by piano! Joanna will be back to host our shows! Watch her and our artists in action in the playlist below. Music & Truffles KIDS is designed for young people ages 5 to 11, but it is also a great series for adults just starting to explore the mysteries and ecstasies of classical music – you are not required to bring a young person, and you will get a Lindt chocolate truffle anyway! I don’t believe there is another series anywhere which presents such outstanding artists in programs specially designed for young people, at such a bargain price. 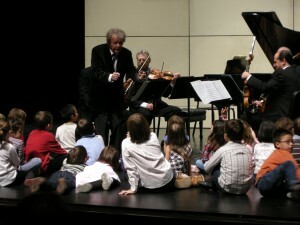 Music & Truffles KIDS lets great youngsters hear great artists! ONLY $20.oo per person per show! These programs are shorter versions of the Concert Series, which take place later that day. We use the same world renowned artists to perform shorter pieces or movements of larger ones. The artist, host or both will help bring the music to life by discussing and illustrating it, and stimulating the youngsters’ imagination and appreciation with entertaining, interactive comments. Many children and adults who have attended these series have gone on to discover their own musical abilities. Don’t miss your opportunity for a unique classical music experience. Watch samples from our previous shows playlist below to see for yourself. 2018-19 season ends April 14th! 2019-20 season begins October 20th! 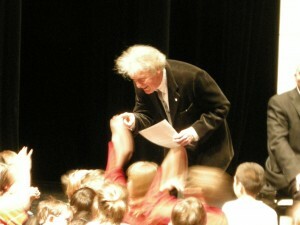 "My daughter was thrilled to be able to sit on stage when Anton Kuerti was hosting in November." "I enjoy these concerts more than my children; I just don't tell them." "Great show!. We love this program and have been attending the past three years." "The musicianship is excellent. Quality learning for my children and myself as well." "Thank you Mooredale Concerts for creating this wonderful and stimulating program."